Don't get caught in the cold this holiday season! With a set of needles or a hook, you can create amazing crochet Christmas decorations, knit Christmas ornaments and so much more. Whether you love to crochet, knit or both, this free eBook is filled with ideas for a fiber-filled Christmas season. Make your own ornaments to hang on your tree, create a traditional stocking or think outside the box and work up some fabulous gifts. You can't go wrong with these free Christmas patterns. Use traditional colors like red, green and gold to make your projects extra fun and festive. This eBook includes everything from knitting patterns for beginners to projects for experienced crocheters, so there really is something for everyone. Start thinking ahead and planning projects before it's too late. That way, you can work on crochet ornament patterns early and hang them all on your tree right after Thanksgiving. 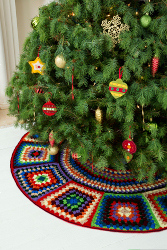 Other knit crochet Christmas decorations such as tree skirts and afghans can also take some time and effort to produce, and there is nothing worse than waiting until the minute! This free eBook includes plenty of easy crochet patterns for ornaments, Christmas knitting patterns and even ideas for holiday wearable. 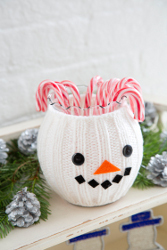 Get in the holiday spirit with these excellent free Christmas patterns. Download your copy of Have a Red Heart Holiday: 20 Knit & Crochet Gifts and Decorating Ideas today. There are so many easy crochet patterns that you can work up and give as a gift to a close friend or family member. If you're looking for crochet patterns, free projects and more, you can't go wrong with the various projects included in this eBook. The Snowflake Hostess Apron is a great gift for anyone that loves to cook and spend time in the kitchen. Free crochet patterns can be tailored to fit the gift recipient and this project is a great example. Chose fun yarn colors and add snowflake motifs to make this project extra special. Other Christmas crochet patterns you can work on and give as gifts include the Holiday Spirits Bottle Bag and Snowman Mug Hug. Both of these gifts are extremely practical and perfect for the holiday season. Give one of each to a hostess or coworker. Don't forget to include your family pet when selecting free crochet patterns! Make your favorite feline friend a Holiday Cat Collar and have them wear it all season long. Your furry friend is an important member of your family and everyone should get in the holiday spirit together. Other free crochet patterns you can give as gifts include the Gift Pocket Scarf and Big Bloom Hat. Both of these wearables are warm, toasty and full of spirit. The holiday season doesn't start until you've hung a few handmade Christmas decorations around your home. This includes ornaments for the tree, stockings, decorative throws and more. One way to add a touch of fun to your holiday decor is by creating a Granny Tree Skirt. This is one of those Christmas crochet patterns that requires a little extra time and expertise, so be sure to give yourself plenty of time! The results are so worth the effort and you'll be able to take this tree skirt out year after year. If you're looking for colorful crochet ornament patterns, you'll love the Bull's-Eye Ornament pattern. The non-traditional look is truly something to behold! Plus, you can make a bunch in a short period of time and hang a bunch on your tree. Did you know that holiday throws add a quick punch of color and holiday flair to your home? Try your hand at the Holiday Balls Throw or the Holiday Heart Throw. Both of these free crochet patterns are warm and toasty - perfect for late nights by the fire! With these free Christmas patterns, you can show off your creativity and get in the holiday spirit without leaving home! Are you more comfortable with a pair of needles in your hand? Start working on a few of these free knitting patterns and impress everyone you love with your skills. Everyone appreciates and handmade gift so make sure to give one to everyone on your list. The knitting patterns, free projects and fun tutorials in this eBook make it a valuable resource for knitter that can't wait to get in the holiday spirit. If you're interested in knitting patterns for beginners, start with the two cozies included in this free eBook. A Buttoned Bottle Cozy makes a great gift for a hostess and the Snowman Jar Cozy is cute, festive and perfect for a plain vase or bowl! You can even make a cozy for an e-reader to ensure it doesn't get scratched. There are also plenty of free Christmas knitting patterns for comfy wearables. During the chilly winter months, who wouldn't appreciate a Polar Bear Hat, Shine On Hat and Scarf or Cozy Knit Wristers? Everyone wants to look good and stay warm at the same time, so any of these Christmas knitting patterns makes a great gift. Is there anything more beautiful than a simple ornament hanging on your tree? Knit Christmas ornaments can really change the look of your space and evoke the greatest memories from the holiday season. Take a look at these free Christmas patterns and come up with ways to incorporate free Christmas knitting patterns into your decor. New to the world of knitting? Knitting patterns for beginners like Little Knit Stockings and Noel Knit Sweater Ornaments are both great patterns if you're looking to try something new and test out new techniques. Best of all, you can create a few of each and place them all over your tree. Use different colors or yarn and try new designs and motifs - it's up to you. Ready to take a walk on the wild side? 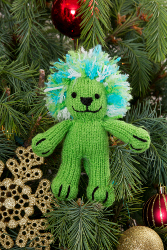 Make two animal-themed ornaments that both kids and adults will absolutely adore. Knit Christmas ornaments don't have to just include snowmen and Santa. Step outside the box and make some silly characters to hang on your tree. Leonara the Lion and Tracy the Tiger are sure to become welcome additions to your Christmas decor. Knit Christmas decorations are fun to make and perfect for the holiday season. Be sure to try something new and get creative so you don't get stuck in a holiday rut. The holiday season is full of cheer and these free Christmas patterns are sure to get you in the holiday spirit. Whether you need an ornament for your tree or a buttoned-up bag for a bottle of wine, there are so many fun ways to make it a handmade holiday. Best of all, you don't have to choose between your crochet hook and your knitting needles in order to create wonderful holiday gifts and pretty decorations. Knit some mini sweater ornaments, crochet a scarf with pockets or even work up a festive collar for your cat. This Christmas, test your skills and try something new - the holidays are the perfect time to think outside the box and impress everyone with your handiwork. unrelated question to the e-book: but I know for a while there was a picture beside our usernames when we comment.. now it is gone and we can't change it? what happened to that? I am going to enjoy using this book. I love the projests. I love the fact that they included 20 projects for crochet as well as for knitting even though I do not knit. I cannot wait to start on my Granny Tree Skirt, Poinsettia Collar (for my dog though), Snowflake Hostess Apron, Holiday Heart Throw, and the Snowman Mug Hug. Thank you so much for sharing this Ebook! Many Thanks! I love the patterns in this eBook. There is just one missing that is shown on the cover, that I would really love. The Giraffe, he is a favourite of my youngest Grandson and I would love to knit it for him... Is it possible to get a free copy of the pattern? I live in Australia and I notice that except for the free ones, any others are only valid to US residents.